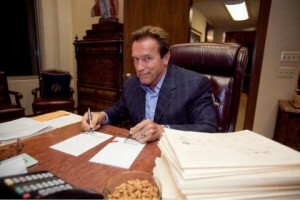 California Governor Arnold Schwarzenegger last night dropped threats to veto more than 700 bills unless the legislature brought him a water package to his liking. Rather, saying a deal was near, he declared the legislature in special session. While the official reversal was more dignified than the Tweet that the Governor sent out reading, “going all out, signing two bills at once,” the proclamation for a special session itself is loaded. Even if the governor enjoyed the consensus necessary to resolve differences over whether or not to build a peripheral canal around the Sacramento-San Joaquin River Delta, the proclamation makes a difficult task all but impossible. * It bundles with a Delta fix demands for two previously rejected dam projects — current estimated costs between $4 and $5bn. The Los Angeles Times has the story on some of what got signed and what didn’t. UPDATE: *Politicians disagree and are out in force cheerleading for a potential deal. On KPCC’s AirTalk, Larry Mantle’s guests are LA Times reporter Michael Rothfeld, Northern Californian Senator Sam Aanestad (R-4th Distrist) and Assembly Member Anna Caballero (D-Salinas). As Aanestad has it, the sticking points include ground-water monitoring and 20% conservation goals for rural conservatives. Caballero, who is heading negotiations for Assembly Democrats, says that, while split, they may accede to the governor’s demand for dams (she authored a $12bn draft bond measure AB 752). She hopes for a deal by the end of the week. VIA Aquafornia: Senate Speaker pro tem Darrell Steinberg (D-Sacramento) and Assembly Speaker Karen Bass (D-Los Angeles) are on YouTube discussing what they now describe as a $9.4bn bill. “Water is considered one of the unsolvable issues in this state,” said Steinberg. “There has been a seeming barrier for decades in terms of resolving California’s water challenges. We believe that we are on the verge of breaking that barrier.” According to Bass, the items covered by the legislation are: Statewide 20% water reduction by 2020, statewide ground-water monitoring, increased water rights supervision and formation of a Sacramento-San Joaquin River Delta stewardship council and conservancy. UPDATE OCT. 13, 2009: A Field Poll gives the legislature and governor record low job approval numbers. To read it, click here. For the full press rundown on water, go to Aquafornia. This post has been updated. 1. To consider and act upon legislation to protect and restore the Sacramento-San Joaquin Delta while also improving the reliability and quality of water supplies from that estuary. 2. To consider and act upon legislation to address the short term and long term improvement of California’s water management system including development of new surface and groundwater storage and improved conveyance facilities, ecosystem health and conservation strategies. 3. To consider and act upon legislation to appropriate funds, including appropriations for general obligation and lease revenue bonds, to improve water resource management, build additional water storage facilities, develop groundwater aquifers, improve groundwater quality and flood protection, and restore the Sacramento-San Joaquin Delta and other important ecosystem restoration projects. 4. To consider and act upon legislation to place a general obligation bond and, as necessary, a lease revenue bond on the ballot. IN WITNESS WHEREOF I have hereunto set my hand and caused the Great Seal of the State of California to be affixed this 11th day of October, 2009.